Rachel is an attorney with Essig & Evans LLP, working exclusively in Fertility Law. She counsels hopeful parents and surrogates on the legal aspects of their collaborative reproduction journey so they can focus on what matters most: building their family. Rachel's clients are from the United States and around the world, and include singles and couples of all sexual orientation. Clients know they can rely on Rachel for prompt, excellent counsel. Fertility law is a unique, nuanced, and ever-changing niche. Rachel developed her practice under the mentorship of Ellen Essig, one of the first -- and amongst the most respected -- fertility law attorneys in the United States. Today, Rachel and Ellen work together at Essig & Evans LLP, one of the few law firms with a dedicated fertility law practice in the surrogate-friendly state of Ohio. Rachel also practices fertility law in the surrogate-friendly state of Illinois. 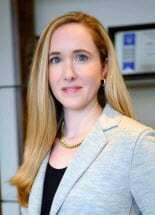 Prior to joining Essig & Evans LLP, Rachel honed her legal skills as head of the legal department at Galls, LLC, and as an associate at the nationally recognized law firm Jenner & Block. Rachel graduated from the University of Pennsylvania Law School, where she was inducted into the Order of the Coif, and Emory University, where she was inducted into Phi Beta Kappa. In addition to practicing law, Rachel is a passionate advocate for families, nature lover, and bookworm. She has served on various boards at the local and national levels. She served six years on the Emory College Alumni Board, including as President and President-Elect, and on the auxiliary boards of Common Threads and Steppenwolf Theater.